The hotel staff were excellent and very friendly. The location is a bit of a walk to the beach but you can get a bus which stops across he road from the Hotel. The rooms were nice but our floor had was a little dirty and could have done with being swept, kept finding hairs off the cleaners on the floor. Pool was busy as it was peak season but there is another quieter pool. We ate in hotel 2 nights and it was fine with quite a lot of choice, something for everyone. Bar was on the pricey side 6 euros for a cocktail! Evening entretainment was not too bad, the younger kids enjoyed it. The spa across the road is handy and is not too expensive, great for croissants for breakfast and water - 5 litres was approx 2 euros! This is a rare treat, very few places will you find this sort of attention to detail. It is clear that this hotel is striving to listen to what the guests want...you can't always please everybody of course but here they try to do everything that they can. We stayed during the school holidays so there were naturally lots of children and the entertainments team here were just fantastic, I have travelled widely and have never experienced such a wide variety of real live entertainment from an "in house" team, I especially was impressed by the live music which was top class. Food in my opinion varied day to day, on the whole very good, but there were 2 days when frankly it did not match it's star rating. Club Duva Spa, excellent !!! Stayed first week July 07 with two boys 10 and 13. Very clean. All inclusive and we thought it was excellent. Its a 10 minute walk into Porta Pollensa which was fine for us and the boys were happy to be at the pool 99% of the time. The food was very nice and the restaurant manager took real pride in his work. The entertainers were in my view the worst I have ever seen or heard and the group we made friends with appeared to convey that was their take on it too, - it became quite a joke. In saying that the children would tell you it was fantastic and they certainly all seemed to enjoy it especially the bingo. I think possibly they were new entertainers and perhaps they will improve. We would definately go back. Tennis courts right next to it and a lovely indoor pool and fantastically equipped gyn, - infact amazing to be honest. For us a 9/10 and our boys tell us best ever holiday so what more can you ask for. We visited in July 07 on a self catering basis and was pleased with the standard of accommodation. Very clean, nice bathroom and enough space for us. Cleaners came every day other than Sunday and changed towels frequently. We were in the main block and my main moan would be was that our room was in front of the speakers for he entertainment which was pretty poor although my 5 year old daughter thought it was great!! therefore, as we were so close we had no choice but to listen to the end or stay out until after midnight. We liked the hotel and the staff were great and felt that the location although a bit far out from the centre was ok as we personally do not like to be in the middle of it al and it was a pleasant walk to the beach. My parents joined us for a few days and they booked the trip independently. Reception were happy to move them near to us and help them when they arrived. The main pool was very busy and the sunbeds were gone very early - there is a quieter pool at the other block (didn't know it was supposed to be exclusive to that block - no one said that!) which we preferred although the beach for the day. Lovely restaurants and able to walk round in the evening. We were there for part of the festival which was nice. Ate at some lovely restaurants along the front - the ones round the square are nice but are more expensive and was much warmer round there! We stayed in a 2 bed premium appartment during June 07, and had no major complaints about the accomodation as it was a good size and clean. Although within the premium block not all of the 2 bed appartments are the same size! A minor complaint would be that there was no information in the apartments on how things worked! (i.e Dishwaher, oven, etc)this would of been handy. Taking an iron with you would be handy as there is none within the appartment and the hotel does not rent any! The one down side in relation to the hotel is it's location, and this is the one reason we will not be going back! The Hotel is located on the outskirts of Puerto Pollensa, and I would estimate it would be about a 15-20 minute walk into town. We had a car which proved very useful, as getting my 5 year old to walk down there would of been a nightmare and there is not a pavement all the way! The staff at the hotel were friendly and the standard of English spoken was very good. They are definitley used to catering for British guests. One possible complaint I could imagine for people staying in the premium appartments during the busy months (July/August)is that part of the extra cost incured for booking these appartments is that you get the use of a seperate pool to the main complex! We found that people from the main complex were coming over and using this pool as it was quieter. This was abit annoying as we had paid more for this facility, but would be more so during the busy months as the sun loungers and particulary the parasols may be full by the time you get to the pool as this area is not as big as the main complex pool, and there were only three parasols! When you have young children these are essential to give them a break from the sun. There is some entertainment put on at the hotel, but in our opinion it was very limited, we went for one night in the first week and did not go again! Some people liked it and some did not, it's all to do with personal preference. Stayed at the Duva in July 2006. I bed apartment with 2 very comfy sofa beds in lounge. Small kitchen diner. Very large bathroom and bedroom with large wardrobes and set of drawers. Good balcony - safe so LO's couldn't fall over. The grounds were beautiful with lily pad pool with loads of fish and baby ducklings!! Pools were Ok unfortunately no shallow end in large pool so you have to keep your eye onthe non swimmers. We did try the food from the snack bar which was really good. There is a small shop around the corner (opposite habitat apartments) which sells amazing freshly baked rolls and pastries. The evening entertainment was Ok - kids loved it and OH liked it when there was scantily clad dancers!! Bit of a walk to the main square and pine walk but we had a car so used to drive down every night to eat. Some fantastic restaurants on the square. Little arcade for children ( air hockey etc..) on pine walk. Loads of stalls selling jewellery, portrait painters, kids can paint their own pots. There are musician s that come round the restaurants but are not pushy so don't feel obliged to pay them. There is also a childrens entertainer on the Pine walk every night balloon modelling etc... If you eat on the square and you have children take a ball - all the children play here whilst their parents have a nice drink. Do visit cala san vicente - bit of a pebbly beach but the snorkelling is out of this world. My 2 boys (4 & 10) were swimming with shoals of fish and octopus. 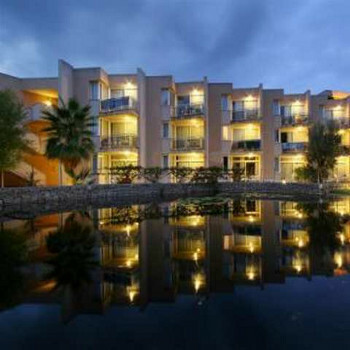 The hotel itself is located about a 15 minute walk from puerto pollensa town and the beach. We had our son who was 12 months old at time of holiday and used the walk to stroll to the beautiful promenade of an evening. Staff were very welcoming and friendly, however their wasn't a great deal for young children to do other than the pool or a few activities at a neighbouring hotel who shared the same entertainment team. We were All inclusive and stayed for one week. The food was decent but a little limited on choice and was a little repetitive.